We are thrilled to “officially” introduce a new concept shop at The Foursome Clothing Store designed to bridge the gap between modern casual wear, versatile denim, fine footwear, and tailored clothing. At The Foursome, we look for inspiration and strive to implement new ideas that reach beyond the ordinary. 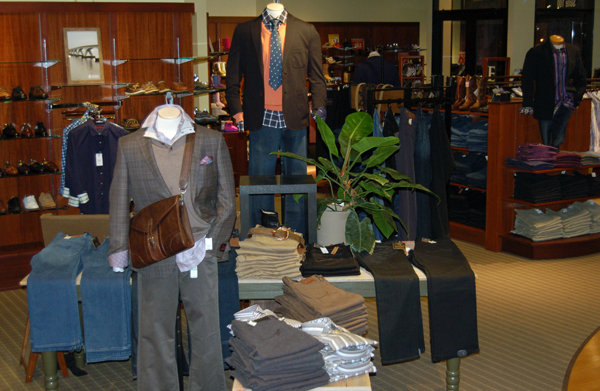 The Bridge is a shop within our men’s shop that offers a new experience to menswear fanatics. It tells a story and gives out-of-the-box ideas to compliment various personalities. Dressing up and down have something in common- they both revolve around denim. If you get out once in a while, you’ve probably noticed that denim is no longer just for weekend house projects. 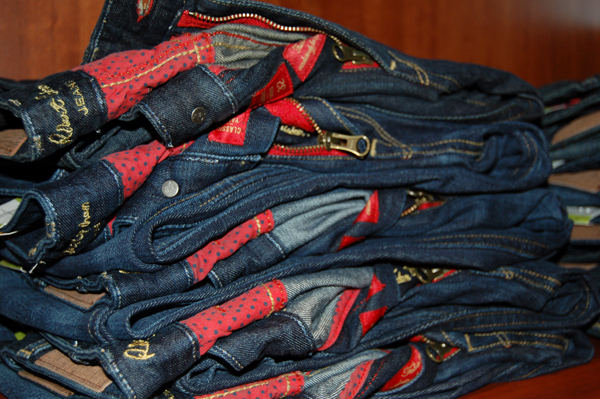 The world of denim has expanded in so many directions that jeans are as varied as a box of crayons. From washes to contours to fabric weight, there are a thousand ways to wear denim and surely a specific brand or two for every individual to fall in love with. Medium to dark washes in denim give a more sophisticated look that can even be worn in place of dress pants at times. New for us this season is Robert Graham denim with a hand and wash that is quite unique. Their signature red pocket lining with polka dots and washed-out multi-color stitching on the back pockets put these jeans over the top. Oh 34 Heritage denim, how we love you. More than any other item in our store, we recommend our 34 Heritage pants to everyone. What guy wouldn’t want to wear denim with stretch and superb quality that makes them look amazing. With a lower rise and younger man’s cut, Mavi jeans are made to fit the body well. This well trusted brand has been in the business for years. 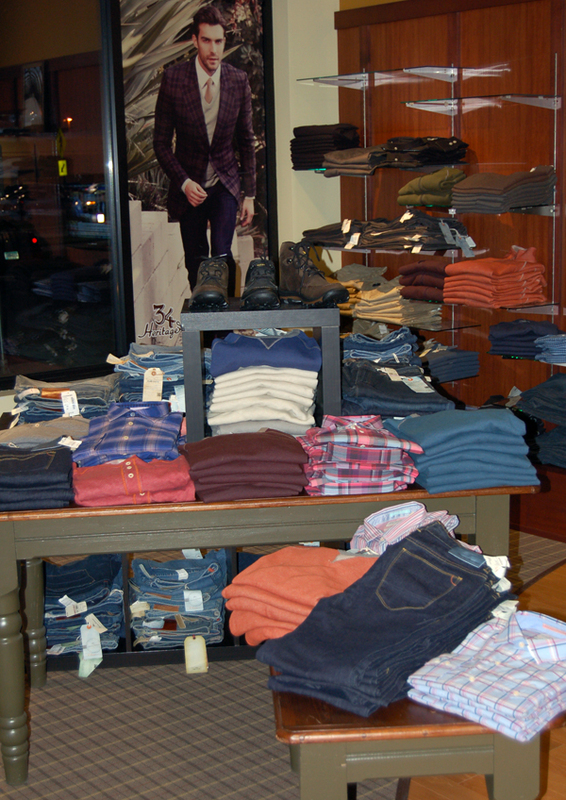 Tommy Bahama denim continues to make great jeans in a variety of washes. Their fashion denim is as current as any. 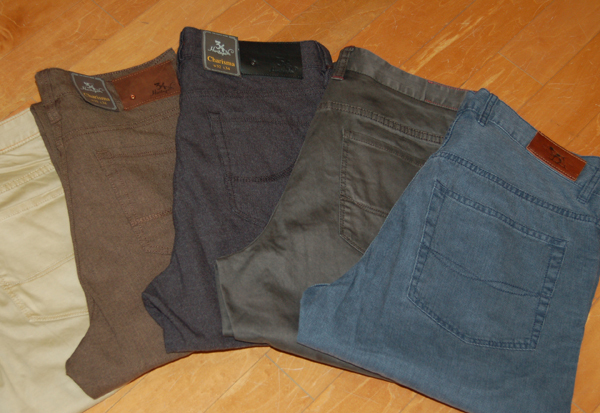 In addition to denim, our Bridge area has an assortment of five pocket pants. Like jeans with five pockets and exposed stitching, these pants have a similar look and feel but are constructed out of different fabric weaves and vary in drape. From canvas to velvety cotton to variegated blends with a bit of stretch, this casual pant is a great alternative to denim but with the same comfort and wearability. Five pocket pants could even replace a more traditional pair of khakis you have had in your drawer for a while. The Bridge showcases more than just pants. 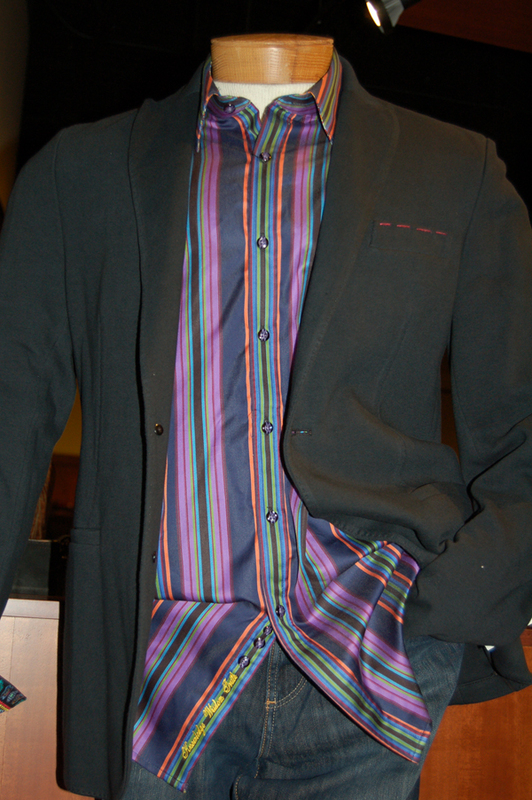 As for tops, we love our Robert Graham collection full of flavor and everything special. Made with extraordinary attention to detail from the interior woven label to contrasting cuff prints to unusual buttons hand picked to compliment each shirt. Our Italian designed Bugatchi line offers modern and colorful woven shirts that look great with denim and the like. Thomas Dean button down shirts have their own look, perhaps more subtle in aesthetic but with wide spread collars and interesting cuff combinations they are very current. Offering more casual top options, our beloved Tommy Bahama denim line adds in some great long sleeve layering pieces as well as a wonderful selection of woven shirts. In menswear magazines and on the street, soft coats worn with jeans are all the rage. The non-dictionary definition of a soft coat; a soft shouldered, less structured, less formal sport coat that is both comfortable and versatile. I tell guys they can even wear them like a they would a zip-up sweatshirt or their favorite quarter zip sweater. Think of a these sport coats as another layering piece and a must have! The options abound in fit and as well as fabric. You will find them made by a handful of brands and sprinkled throughout the Bridge shop. 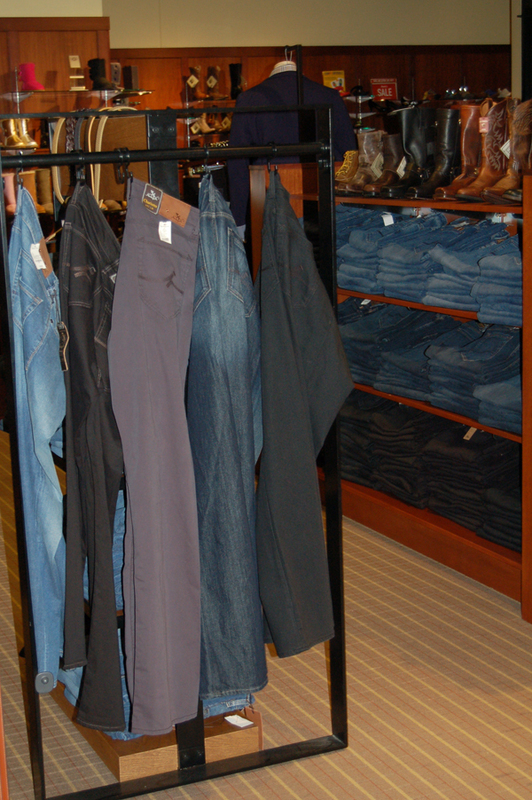 Come and explore The Bridge, the place to to buy denim!